Slicing Up The Product The critical text in the ruling is the phrase an “article of manufacture”. Prior to this seemingly simple decision, the courts defined “article of manufacture” as an entire product as purchased by the consumer. The highest court now says that damages can be based on less than the total product because it is possible that the “article of manufacture” to which a design patent has been applied may be less than the total product. Think about that for a moment. As one of the leading design professionals in the industry, imagine, if you will, how complex it will be to identify the “article of manufacture” to which the design patent has been applied by separating a design into component parts. Samsung Victory This is, of course, exactly the change that Samsung wanted all along because it meant that Samsung would now likely have to pay damages only on those parts of its phones to which the Apple design patents had been applied. It is important to note that Apple asserted several design patents covering key design features of the original iPhone but did not assert a single patent that covered the entire iPhone. Such an approach is common when protecting the overall look of successful products like the iPhone. After Samsung lost the original case it began thinking long and hard about how to reduce the size of the damages award. Even though apparently Samsung failed to raise this issue at the original trial, it began a very aggressive set of appeals with the purpose of reducing its payout by limiting its exposure to only the component parts of the iPhone covered by the asserted patents. This became the center of Samsung’s entire appeal process and the nature of the opposing amicus briefs submitted by teams of law school professors and others. Job Half Done Even though the justices ruled that damages could be calculated based on defining the “article of manufacture” as being less than the total product, they failed entirely to provide a test for how to identify the “article of manufacture” to which the design has been applied. This may seem like a simple issue, but in reality not having a procedure for identification of the “article of manufacture” leaves the entire design IP protection system in a state of near total chaos. Dotted Lines Make It Clear Think of the problem this way: In the original case, Apple asserted, among other patents, it’s 677′ and 305′ patents covering the design of the faceplate of the iPhone and the icon design and structure of the iPhone interface. The two Apple patents are shown below. 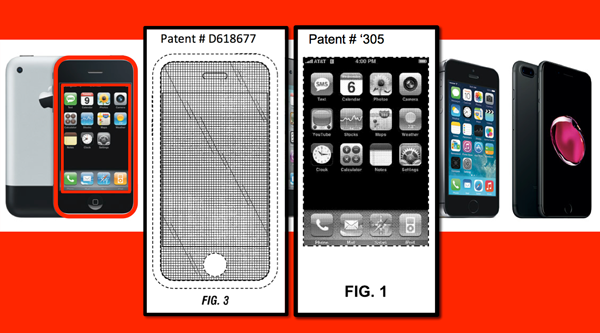 The dotted lines in the patents show features of the iPhone design that Apple did not claim in its patents. Dotted lines in design patents are included to indicate only the context of the claimed designs but not the actual claimed design. Samsung has taken the position that any aspect of the iPhone not shown in solid line should not be included in damage calculations. Samsung has been supported in its thinking by a series of loopy hypothetical scenarios created by legal academics. None make sense, but still, Samsung kept after it and eventually won a ruling from the Supreme Court that is now history. Here Is The Question When the Apple patents are “applied to” the accused Samsung smartphones, is the “article of manufacture” just the faceplate and screen area? Or, is the “article of manufacture” to which Samsung has applied the faceplate design and icon interface the entire phone? Clearly, there is no Samsung smartphone without application of the two iPhone patents. One can see immediately the level of confusion this new Supreme Court ruling has created. The conflict is now MORE complex and dangerous for all design professions. No one is spared in this new world. There is more. Piece Parts and Profits Samsung and a large body of law school professors believe that the “article of manufacture” can only be the physical faceplate of the iPhone and nothing more. This would mean that Samsung would pay damages related only to the piece part cost of the iPhone faceplate. This would be a sum so small as to make the damages absurd. Why would any major corporation continue to support and fund design for products they cannot protect? It is clear by its later actions that the Supreme Court knew what it was doing when it failed to define a test for the “article of manufacture”. 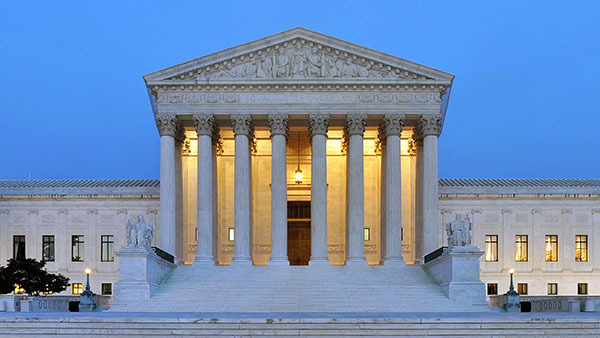 Kicking The Can Down the Road So confused was the Supreme Court over how to construct such a test that the high court sent the entire case back to the Federal Circuit with the specific direction for the Federal Circuit to determine the “article of manufacture” test. Sensing the potential for massive conflict and complexity, the Federal Circuit wanted nothing to do with this task and early this year sent the case all the way back to the District Court in California where the original trial took place. Judge Koh, the original judge, was tasked with determining whether or not a retrial would be required based on the ruling by the Supreme Court and the remand from the Federal Circuit. Judge Koh Asks For Opinions On The “Article of Manufacture” Test In September 2017, Judge Koh asked both parties (Apple and Samsung) for briefs describing in detail how each would define the “article of manufacture” test should a new trial be allowed. In late September 2017, both Apple and Samsung submitted briefs describing preferred methods for addressing the utter chaos created by the Supreme Court ruling. The approaches could not have been more different. There was really nothing surprising except that Apple’s recommended methodology was somewhat aligned with the Department of Justice methodology presented in its original amicus brief submitted to the Supreme Court in the case. Samsung’s approach bore no resemblance to the DOJ methodology. Left To Swing In The Wind Since the Supreme Court ruling several other important design patent infringement cases (unrelated to Apple v. Samsung) have been winding their way through the legal system based on the yet to be defined “article of manufacture” test. In these new cases the legal teams, judges, and juries have been left to work out the test in their own manner without the benefit of legal rulings or precedent. However, a close examination of the briefings in those cases shows that plaintiffs (patent holders) are utilizing methods closely aligned with Apple’s proposed test, and defendants (accused infringers) are offering up methods tightly aligned with Samsung’s approach. In other words, patent holders and accused infringers are basically aligned on overall approach – and they are miles apart. What Is Old Is Now New Again On October 23, 2017, just as this update was in final editing, Judge Koh ruled that she will, in fact, sit for a new, fourth trial in the Apple v. Samsung case. She has agreed that a new trial is required to resolve the question of damages as now evidenced by the recent Supreme Court Decision. However, Judge Koh has given the “article of manufacture” test clarity. She stated in her published opinion that the test to be applied would be essentially the methodology proposed by the U.S. Department of Justice as published in the department’s amicus brief to the Supreme Court. Taken overall, the DOJ test is much closer to Apple’s preferred test than to Samsung’s recommended test. The case is essentially back to square one, but with more complexity, more cost, more uncertainty, and a new damages methodology. However, if a legal test must be defined that addresses the article of manufacture question design took the day…more or less. Now What? It is safe to say that the design patent landscape has changed – and changed dramatically toward greater complexity, higher costs, and longer trials. This can only be good for those who would like to infringe with impunity. However, on the positive side, the case has forced design professionals, design organizations, leading design colleges and design-driven corporations to finally develop objective data on the true value of design as a corporate asset. This can only be seen as a major advance for design overall. This data will certainly help patent holders in litigation once the “article of manufacture” test has been solidified in the courts. Less Design Protection However, in the meantime, design as a corporate asset has taken a negative hit that cannot be denied. In the larger view, design is less protected today than at any time in the last 100 years. As the case progresses I will relay an occasional update. Finally, thank you for your continued support of design protection theory and practice.